The ceremonial counties are areas of England to which are appointed a Lord Lieutenant, and are defined by the government as counties and areas for the purposes of the Lieutenancies Act 1997 with reference to the metropolitan and non-metropolitan counties of England and Lieutenancies Act 1997. They are often used in a geographic reference frame, and in this capacity are sometimes called geographic counties. The concept of the counties used for the Lieutenancy differing from those used for administrative purposes is not a new one: some counties corporate were appointed separate Lieutenants from the larger county (often the posts would be held jointly), and the three Ridings of Yorkshire had been treated as three counties for Lieutenancy since the 17th century. The Local Government Act 1888 set up county councils to take over the administrative functions of Quarter Sessions in the counties. It created new entities called "administrative counties" that constituted all the county apart from the county boroughs: also some traditional subdivisions of counties were constituted administrative counties, for instance the Soke of Peterborough in Northamptonshire and the Isle of Ely in Cambridgeshire. The Act further established that areas that were part of an administrative county would be part of the county for all purposes. The largest difference was the existence of the County of London, created both an administrative county and a "county" by the Act, which covered parts of the historic counties of Middlesex, Kent and Surrey. Other differences were small and resulted from the constraint that urban sanitary districts (and later urban districts and municipal boroughs) were not permitted to straddle county boundaries. Apart from in Yorkshire, areas that were subdivided were retained as a single ceremonial county. For example, the administrative counties of East Suffolk and West Suffolk, along with the county borough of Ipswich, were considered to make up a single ceremonial county of Suffolk, and the administrative county of the Isle of Wight was part of the ceremonial county of Hampshire. The term Ceremonial County for these entities is an anachronism—at the time they were shown on Ordnance Survey maps by the name "counties" or "geographic counties", and were referred to in the Local Government Act 1888 as simply "counties". Apart from minor boundary revisions (for example, Caversham, a town in Oxfordshire, becoming part of Reading county borough and thus of Berkshire, in 1911), these areas changed little until the 1965 creation of Greater London and Huntingdon and Peterborough, which resulted in the abolition of the offices of Lord Lieutenant of Middlesex, Lord Lieutenant of the County of London and Lord Lieutenant of Huntingdonshire and the creation of the Lord Lieutenant of Greater London and Lord Lieutenant of Huntingdon and Peterborough. In 1974, administrative counties and county boroughs were abolished, and a major reform took place. At this time, Lieutenancy was redefined to use the new metropolitan and non-metropolitan counties directly. Following a further rearrangement in 1996, Avon, Cleveland, Hereford and Worcester, and Humberside were abolished. This led to a resurrection of a distinction between the local government counties and the ceremonial or geographic counties used for Lieutenancy, and also to the adoption of the term "ceremonial counties", which although not used in statute was used in the House of Commons prior to the arrangements coming into effect. Avon was mostly split between Gloucestershire and Somerset, with Bristol regaining its status of a county in itself. Cleveland was partitioned between North Yorkshire and County Durham. Hereford and Worcester was split into Herefordshire and Worcestershire. Humberside was split between a new ceremonial county of East Riding of Yorkshire, with the remaining parts going to Lincolnshire. Also at this time, Rutland was restored as a ceremonial county. 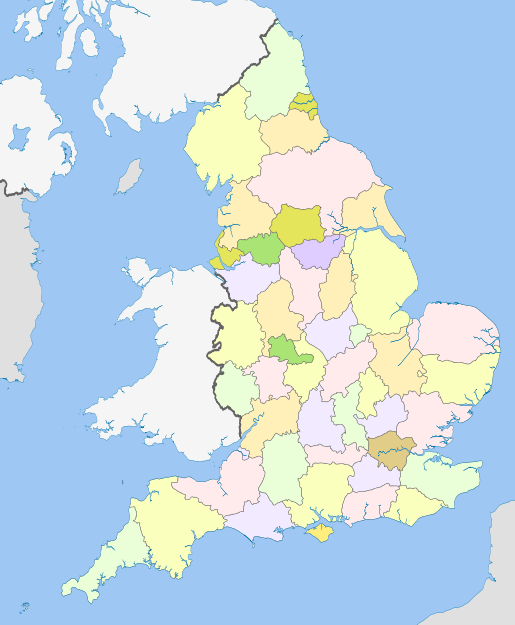 Many county boroughs were re-established as "unitary authorities" which involves establishing the area as an administrative county, but usually not as a ceremonial county. Most ceremonial counties are therefore defined today as groups of local authority areas; the same situation as prevailed between 1889 and 1974. The Association of British Counties, a traditional counties lobbying group, have suggested that the ceremonial counties could be restored to their ancient boundaries, or as near as is practicable. ^ "History of the counties". jonathan.rawle.org. Jonathan Rawle. 2007. http://jonathan.rawle.org/hyperpedia/counties/history.php. Retrieved 2007-12-08. ^ "Schedule 1: Counties and areas for the purposes of the lieutenancies in Great Britain". Lieutenancies Act 1997. Office of Public Sector Information. 1997-03-19. http://www.opsi.gov.uk/acts/acts1997/ukpga_19970023_en_2#sch1. Retrieved 2007-12-08. ^ "Lord-Lieutenants". The Local Government Changes for England (Lord-Lieutenants and Sheriffs) Order 1997. Office of Public Sector Information. 1997-08-12. http://www.opsi.gov.uk/si/si1997/19971992.htm. Retrieved 2009-03-22. ^ "The Local Government (Structural Changes) (Miscellaneous Amendments and Other Provision) Order 2009". The Local Government (Structural Changes) (Miscellaneous Amendments and Other Provision) Order 2009 (SI 2009/837). Office of Public Sector Information. 2009. http://www.opsi.gov.uk/si/si2009/uksi_20090837_en_1. Retrieved 2009-05-10. ^ "The Avon (Structural Change) Order 1995 (S.I. 1995/493) Part III: New Counties". Office of Public Sector Information. 1995. http://www.opsi.gov.uk/si/si1995/Uksi_19950493_en_3.htm. Retrieved 2009-03-12. This page uses content from the English language Wikipedia. The original content was at Ceremonial counties of England. The list of authors can be seen in the page history. As with this Familypedia wiki, the content of Wikipedia is available under the Creative Commons License.